But why not post a powerful video for other key milestones across a SSEP flight opportunity, say when astronauts on the International Space Station return to Earth? This morning, at 4:49 am ET, the Soyuz TMA-17M spacecraft undocked from ISS with Expedition 45 astronauts Kjell Lindgren (USA), Oleg Kononenko (Russia) and Kimiya Yui (Japan). At 7:19 am ET a de-orbit burn was initiated, starting their descent to planet Earth. By 8:12 am ET, the vehicle had landed in Kazakhstan. At this moment, recovery helicopters are landing near the capsule. Over their 141 days in space, they saw 2,256 orbits of Earth – 2,256 sunrises. So … in honor of their return to Earth, and in honor of the over 13,000 students that have been engaged in Mission 9 to ISS, and the Mission 7 and 8 communities awaiting launch of there flight experiments on SpaceX CRS-8 and SpaceX CRS-9 from Cape Canaveral Air Force Station, FL, we post the following video. 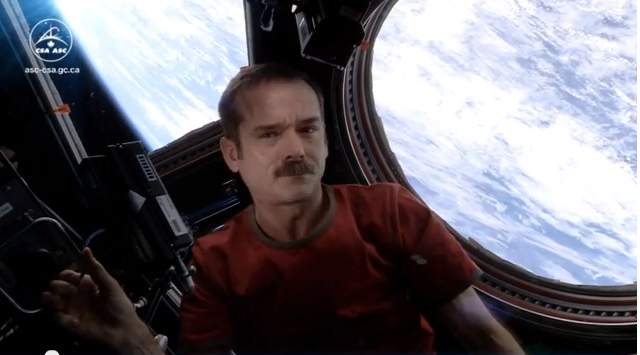 Just before his return to Earth on Soyuz 33S, on May 13, 2013, Expedition 35 International Space Station Commander and Canadian astronaut Chris Hadfield – the first Canadian to walk in space –released this video. We are also honored that we can share this with our two SSEP Canadian Communities participating in Mission 9 to ISS – West Vancouver School District, British Columbia, and Langevin School, Calgary, Alberta. Teachers, we invite you to lower the lights in your classrooms, select ‘full screen’ on the video below, project it on a big screen, and let all your SSEP student researchers see that they are truly part of this adventure. Afterward, you might also consider having a class discussion about the emotional content of this song, who is singing it (here is Chris’ bio at the Canadian Space Agency), where he is singing it, and what it must feel like to leave Low Earth Orbit and return to Earth after an extended stay on Station. Human exploration? It is a wondrously emotional endeavor, and we express that emotion in myriad ways – through art, through prose and poetry, through story-telling, and through music. And all this goes hand-in-hand with science, and more generally STEM – really. The human condition is an interdisciplinary tapestry – something to be celebrated in all our classrooms. The Smithsonian National Air and Space Museum, Center for the Advancement of Science in Space (CASIS), and Subaru of America, Inc., are U.S. National Partners on the Student Spaceflight Experiments Program. Magellan Aerospace is a Canadian National Partner on the Student Spaceflight Experiments Program.